One thing that won’t come standard with the new iPhone: transit directions. WalkScore is launching a campaign to preserve transit directions as a standard feature in Apple's mobile devices. 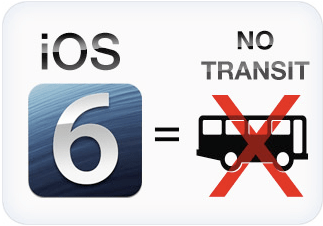 Yesterday Apple announced details for iOS 6, the new operating system for iPad and iPhone, and it looks like transit directions will be casualties of the company’s decision to drop Google Maps as its default map application. The new, Apple-developed map application will include driving directions and walking directions, but no transit information, at least not standard. Instead, if you want to figure out how to get somewhere without driving, users will have to download a third-party application. In response, WalkScore today launched a campaign to have the transit feature restored, asking supporters to tweet Apple directly. “We believe that having built-in transit directions on your phone helps public transit work better for everyone,” the company says on its petition site. Even so this is a big step backwards for pedestrians and transit users, because it forces those people to first know they have to acquire a third party application, then find and install the best one, and finally perhaps pay for this support. By contrast today’s iOS users have excellent pedestrian and public transit support in the Google Maps application. Apple has sold more than 180 million iPhones since the product debuted in 2007. Apple fans go in Luxury cars not in buses. I can’t believe they are doing this. How many people do I see riding the Orange Line in LA looking at their iPhones the whole time? Many many many young urban folks love their iPhones and their public trans. It just doesn’t make sense. Is the auto industry responsible? I hate to be the conspiracy guy, but it’s just so illogical. And here’s the eyes-free screen shot from the conference. @0ba1a60b73486a9e5c396eb97cea02be:disqus I’m going to have to veto that. I’ve used smartphones on buses many, many times. I’ve even opted for the bus over the subway so that I’d have cell service. This is simply not true. Macworld has explained there will be transit directions, but Apple is not storing the data itself. Apple never announced anything regarding this as WalkScore claims. Regardless, the new OS is being PREVIEWED right now and won’t be available until the fall. What is at WWDC right now is by no means a final version. Additionally, Apple is doing something a little different when it comes to public transit: Instead of storing its own data, Maps will integrate third-party app information, ensuring that you tap into the best database for your queries. Just another reason not to buy an iphone. Google Maps on Android has public transit directions and bicycle route directions. So perhaps, if it’s not finalized, a big outporing of complaints from the walkscore petition will help them reconsider making the transit app standard on their next phone version. This is probably the lamest thing to happen with the fallout between Apple and Google. Still, not sure it’s worth switching to Windows Phone for that, especially given Microsoft’s spotty track record in the mobile market. Additionally, once the default Maps app changes from Apple to Google, we can count on Google releasing a Google Maps app for iPhone & iPad. So users will still have a choice. Clearly, RB doesn’t ride transit in NYC (or any other major city). iPhones everywhere. Now on front page of our Transit Advocacy website in South Carolina. A step backward by a company we thought stood for better things. Heh. It long ago occurred to me that the one good thing Apple may have done is gotten some narcissists with short attention spans to take a bus or train so that they can play with their devices and not run people over fiddling with a car stereo. This is a sign of what’s to come from Apple now that Steve Jobs is no longer making decisions there. He was not the type of person to let something like this happen. But from here out, expect a lot of these “cost engineering” decisions to be layered within overall strategic direction. Which means: be prepared to really start hating them soon. 1) The current Maps app in iOS is Apple’s. It uses data from Google, but Apple created the app. Apple is not removing Google Maps for iOS; it never existed. 2) Google recently began charging to use their Google Maps data. 3) Mapping is becoming a core feature of mobile operating systems, and Apple didn’t want to be beholden to Google for a core part of their OS. Google is free to submit Google Maps as an app into the iOS app store. Users would then be free to choose between Apple and Google’s mapping apps. I’m sad to see the transit portion of this go. Part of me thinks this is because Apple doesn’t have a good solution yet and needs to buy time. It’s true that the current transit integration with Google maps doesn’t work that well. It seems to rely on schedules and not actual arrival times backed by GPS and other real-time data. Hopefully, this is temporary, and Apple begins to roll their own transit functionality into their app. I have yet to see a really good mobile solution for transit on the iPhone, largely because transit agencies aren’t giving out real-time data. Does anyone know of a really good one for the DC Metro and buses? A number of comments suggest this report is incorrect. It is never a good idea to draw conclusions from unreleased or beta software. Features get added and adjusted. Save the knee-jerk Apple bashing for somewhere else. Real time transit info might be useful in cities with spotty coverage and poor performance (so: American cities), but it’s not so useful otherwise, and probably significantly more difficult to obtain and use. Good coverage is much more important. Google Maps transit info is definitely based on schedules rather than real-time GPS tracking. Not that many agencies make that info publicly available in a useful format, and in places (like here in LA) where they do, it’s still iffy because not all vehicles are tracked. Doubtless Google will work that into the app when it becomes more widely available and robust. For now, there’s Nextbus to double check the Goog’s schedule-based info on the spot. What about biking directions? It’s a huge gap in the current iPhone (check out the “get there by bike” app for a pretty slick implementation). interesting in this screenshot for walking directions- http://grist.files.wordpress.com/2012/06/photo-3.png?w=313&h=470 Apple warns “Use caution when using walking directions”. I wonder if they have the same disclaimer for driving directions. Seems much more dangerous to be driving while staring at your iphone than walking. Everyone here seems to feel that because the times are inaccurate with Googles Transit map that it isn’t useful. But I find it most useful to find out what route I need to pick up where to get to my destination. I don’t have an encyclopedic knowledge of the San Francisco MUNI bus system. encouraging people not to use mass transit, maybe awesome… maybe instead you should drop real time gps on maps, so people don’t drive and stare at their phones… it would save thousands of lives a year… but no, instead, you drop transit, and force people to drive, so they an use your map/gps, crash, and die. again… awesome. oh and great way to help the enviorment. i think i’ll stick to my driod now..
Apple’s about to build a big suburban spaceship of a headquarters, far away from transit and the city core. They could care less about transit accessibility… it seems to be a cultural thing at Apple, at least among the decision makers. And this type of Apple rule-the-world nonsense is the reason I got an Android phone. This is a bummer because I use this feature at least six times a day, living in NYC. Late at night, who wants to wait twenty minutes in a subway station or not know the fastest way to get home? Oh and in NYC, the Google transit app is 99% correct for arrival times, down to the minute – even for buses. It’s kind of unbelievable. Pfft, never have nor will like Apple’s products. Well this is good or bad its up to the type of user who required this or not. If you required this then its a bad news for you.